10-Bottle Essential Oil Carrying Case is designed to hold 5ml (1/6 oz), 10ml (1/3 oz), or 15ml (1/2 oz) round bottles, up to 1 3/16" diameter. Will also hold 10ml (1/3 oz ) essential oil roll-on bottles up to 3 3/8" tall. 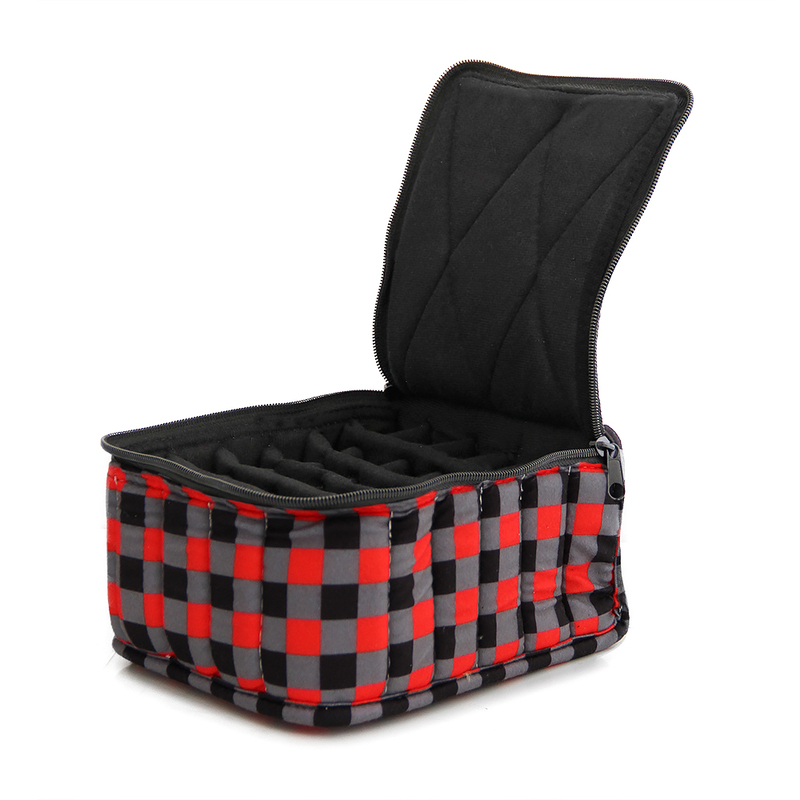 This versatile travel case measures just 8" wide x 5" tall x 2" deep. 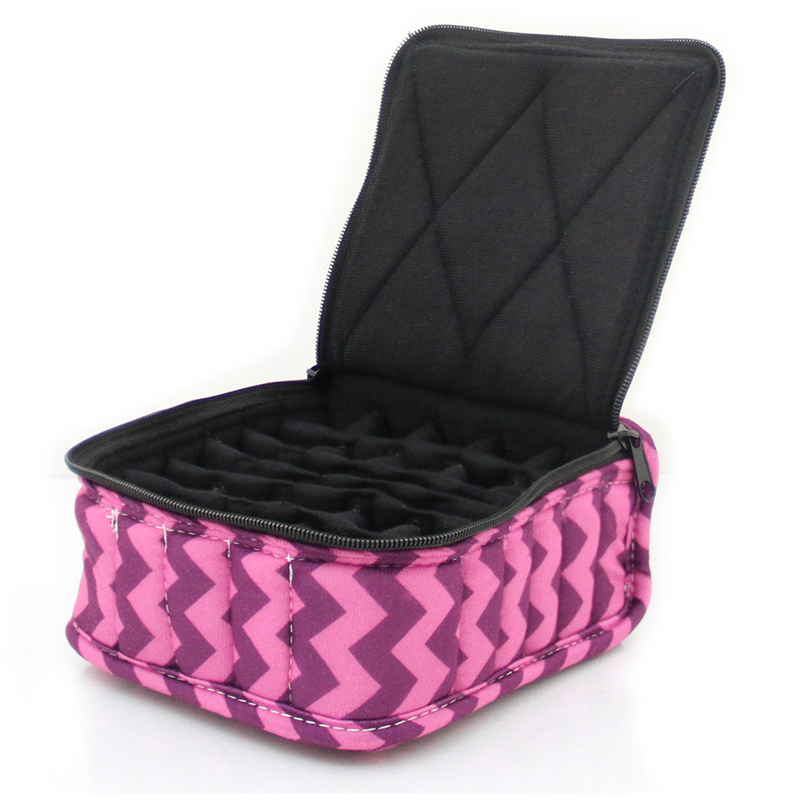 16-Bottle Essential Oil Carrying Case is perfect for 5ml (milliliter) bottles and will accomodate 15ml (1/2 ounce) bottles as well, up to 2 5/8" high and 1 1/8" diameter, so it's great for holding a mix of both sizes. If you use mostly 15ml, however, then you may want to get the 4-inch high case as it zips shut better with that size of bottle. The 3-incher shown here will, however, hold 16 of all 15ml bottles and zip shut, but it is a tight fit. Case measures 5" wide x 5" deep x 3" tall. Case measures 5" wide x 5" deep x 3" tall. Color: Black/White Polka Dot exterior / Black interior. 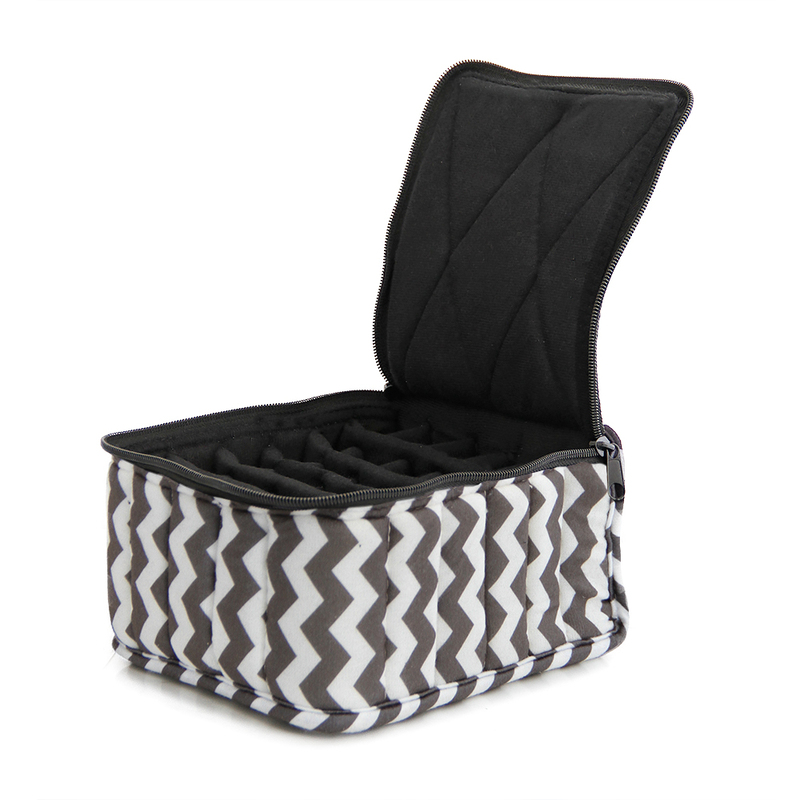 16-Bottle Essential Oil Carrying Case is perfect for 5ml (milliliter) bottles and will accomodate 15ml (1/2 ounce) bottles as well, up to 2 5/8" high and 1 1/8" diameter, so it's great for holding a mix of both sizes. If you use mostly 15ml, however, then you may want to get the 4-inch high case as it zips shut better with that size of bottle. The 3-incher shown here will, however, hold 16 of all 15ml bottles and zip shut, but it is a tight fit. Case measures 5" wide x 5" deep x 3" tall. Case measures 5" wide x 5" deep x 3" tall. Color: Grey Chevron exterior / Black interior. 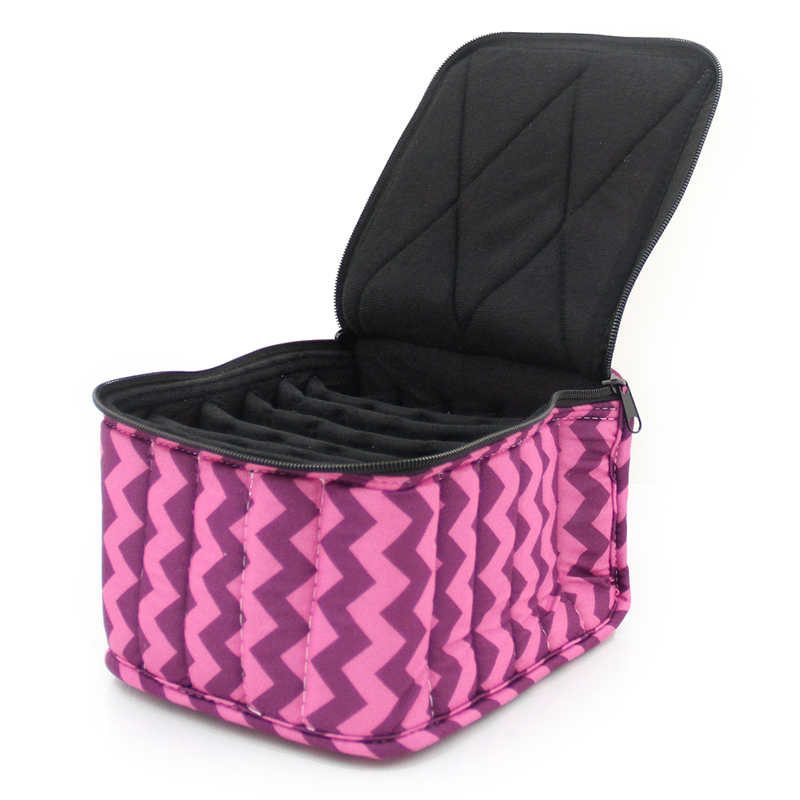 16-Bottle Essential Oil Carrying Case is perfect for 5ml (milliliter) bottles and will accomodate 15ml (1/2 ounce) bottles as well, up to 2 5/8" high and 1 1/8" diameter, so it's great for holding a mix of both sizes. If you use mostly 15ml, however, then you may want to get the 4-inch high case as it zips shut better with that size of bottle. The 3-incher shown here will, however, hold 16 of all 15ml bottles and zip shut, but it is a tight fit. Case measures 5" wide x 5" deep x 3" tall. Case measures 5" wide x 5" deep x 3" tall. Color: Jungle Camouflage exterior / Black interior. 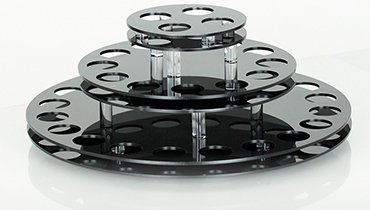 Essential Oil Retail Display Rack holds 240 15ml bottles (not included) in a unique 4-tier 32-channel design. 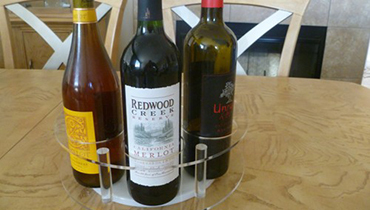 Bottles slide down as the front one is removed, making it a great hands-free inventory helper. 32-channel 4-tier Birch plywood retail display rack makes use of its top retail space as well! Perfect for retail settings and where shelf space is limited, this aromatherapy retail center also holds four (four) 4oz pumps and 26 (twenty-six) 5ml bottles. The 5ml (15/16") holes on top use a tray to sit on, and by removing the tray you can accommodate 10ml (1/3 oz) essential oil roll-on bottles! 30-Bottle Essential Oil Carrying Case for the taller 15ml (1/2 oz) bottles, and also can be used for 30ml (1 oz) bottles up to 4" tall. If you use 15ml-only and no 5ml (1/6 oz) bottles, this is the case you will want, as the 3-inch case gets a bit tight, especially if using the taller, slimmer 15ml bottles that are 2 7/8" in height. Also, if you are searching for a case to hold 1 oz (30ml) bottles, be sure to check your bottle height before ordering. This case will fit some 30ml bottles up to 4 inches in height, however, you may need the 5-inch case available here for taller 30ml bottles. Color: Black/White Polka Dot exterior / Black interior. 30-Bottle Essential Oil Carrying Case for the taller 15ml (1/2 oz) bottles, and also can be used for 30ml (1 oz) bottles up to 4" tall. If you use 15ml-only and no 5ml (1/6 oz) bottles, this is the case you will want, as the 3-inch case gets a bit tight, especially if using the taller, slimmer 15ml bottles that are 2 7/8" in height. Also, if you are searching for a case to hold 1 oz (30ml) bottles, be sure to check your bottle height before ordering. This case will fit some 30ml bottles up to 4 inches in height, however, you may need the 5-inch case available here for taller 30ml bottles. Color: Red/Black/Grey Checkered exterior / Black interior. 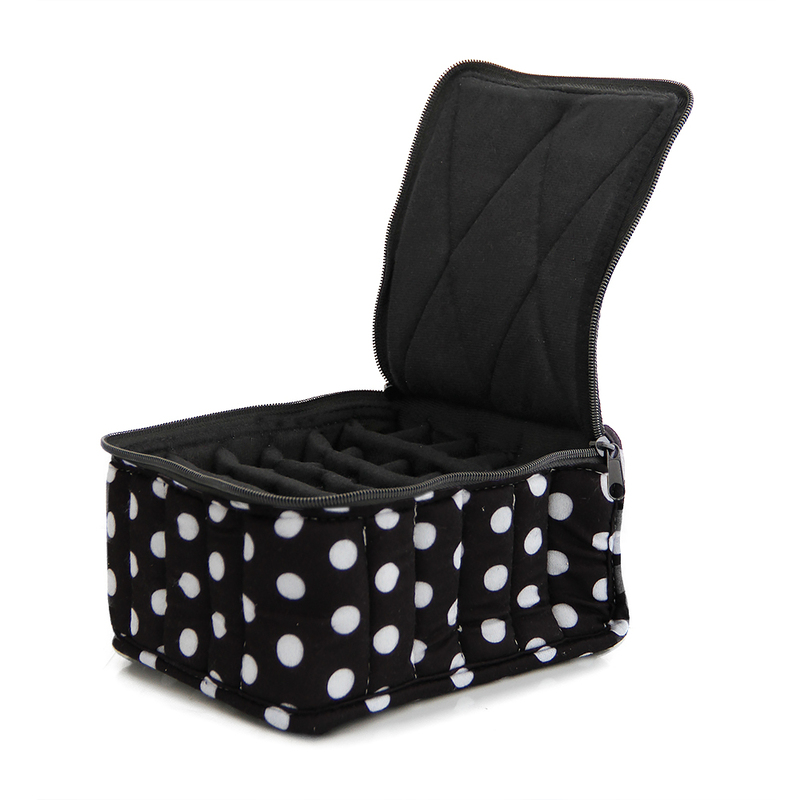 30-Bottle Essential Oil Carrying Case holds 5ml (milliliter), 10ml, and 15ml bottles up to 2 7/8" high. Measures 6" wide x 3" tall x 6" deep. Color: Red/Black/Grey Checkered exterior / Black interior. 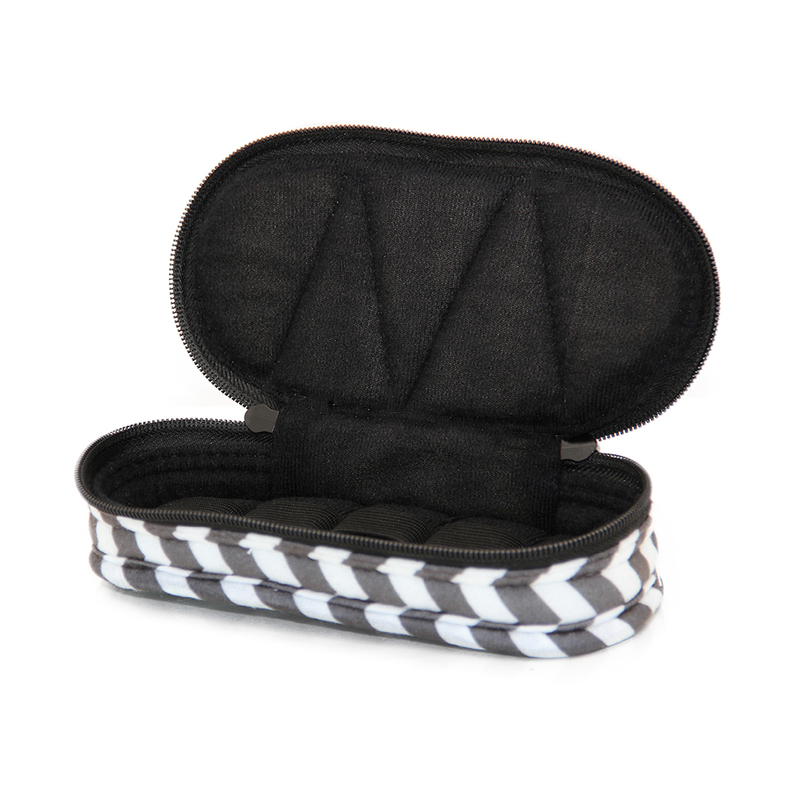 5-Bottle Essential Oil Carrying Case is just perfect for the purse, cosmetics case or jacket pocket. Designed to hold 5ml (1/6 oz), 10ml (1/3 oz), or 15ml (1/2 oz) round bottles, up to 1 3/16" diameter. Will also hold 10ml (1/3 oz ) essential oil roll-on bottles up to 3 3/8" tall. 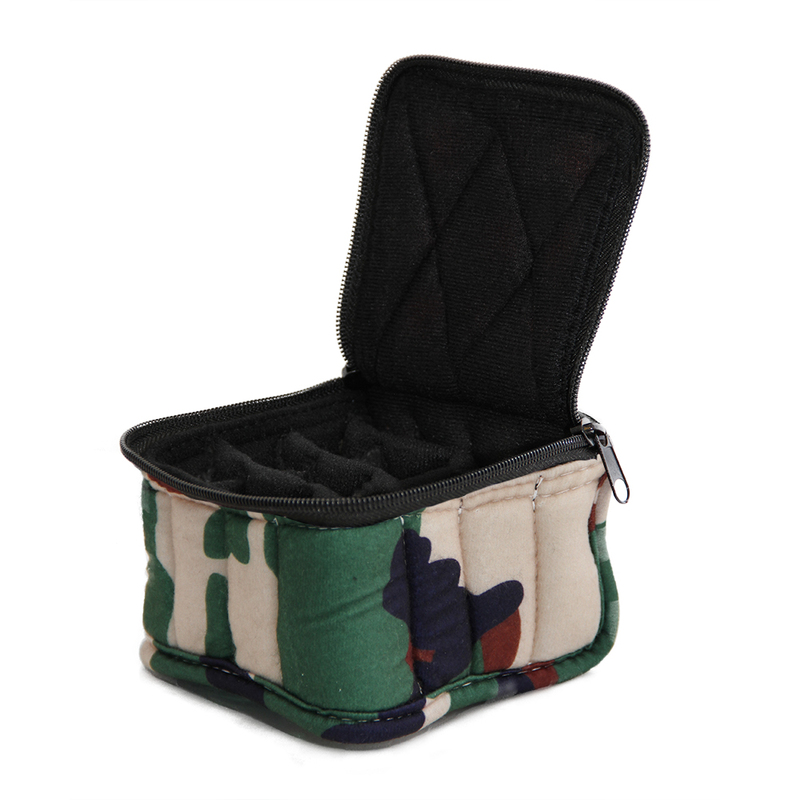 This versatile travel case measures just 8" wide x 1 Â½" tall x 4" deep. Color: Black/White Checkered exterior / Black interior. 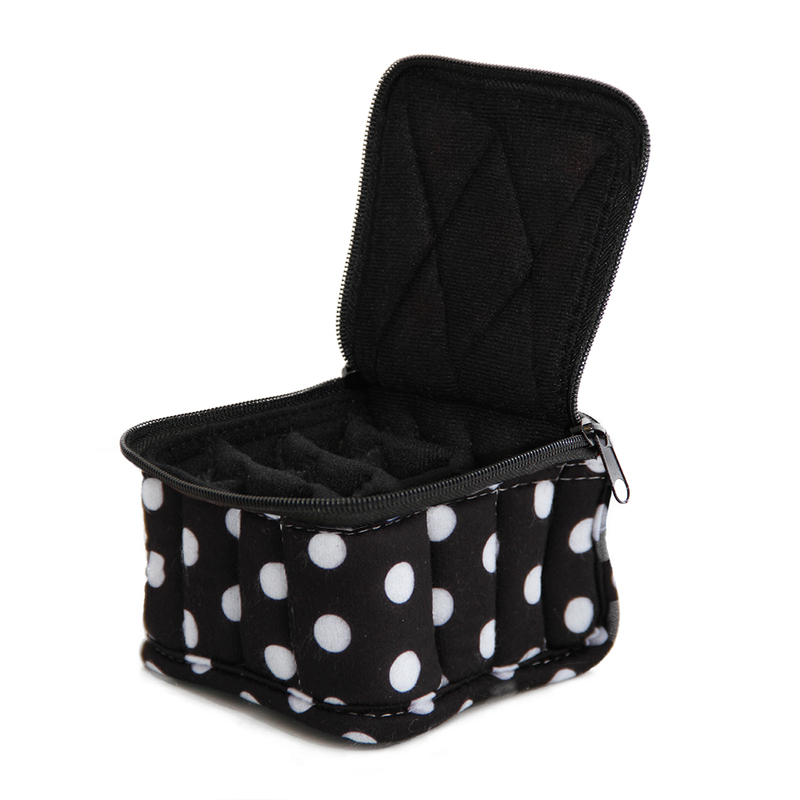 5-Bottle Essential Oil Carrying Case is just perfect for the purse, cosmetics case or jacket pocket. Designed to hold 5ml (1/6 oz), 10ml (1/3 oz), or 15ml (1/2 oz) round bottles, up to 1 3/16" diameter. Will also hold 10ml (1/3 oz ) essential oil roll-on bottles up to 3 3/8" tall. 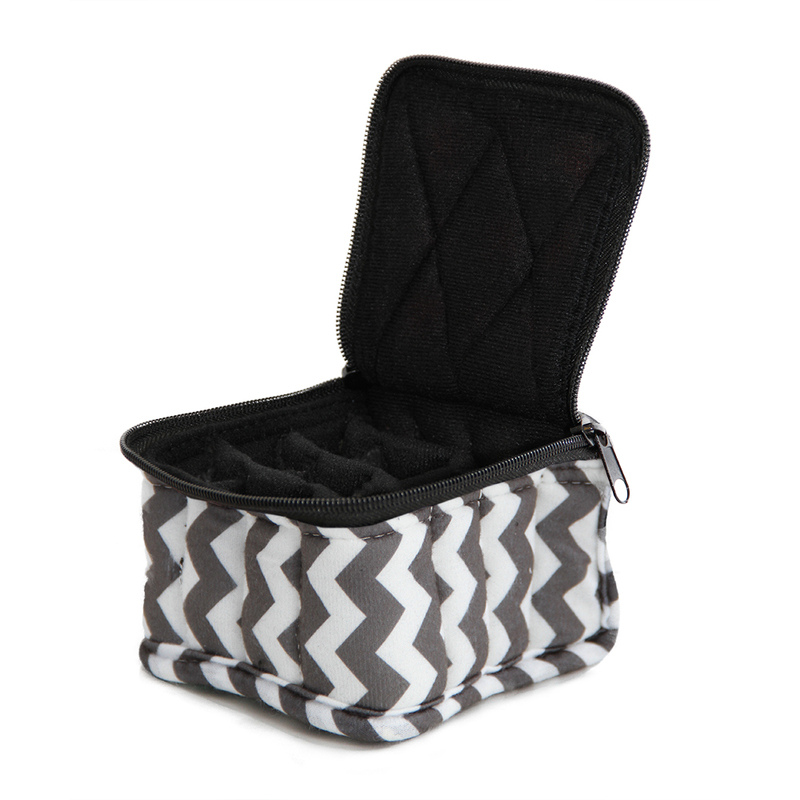 This versatile travel case measures just 8" wide x 1 Â½" tall x 4" deep. Color: Grey Chevron exterior / Black interior. Buzz Away(tm) is great for repelling mosquitos, ants and fleas. 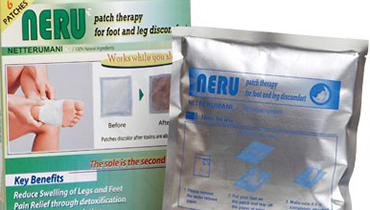 Can also be used directly on skin to cleanse and soothe. When diffused, it helps to purify and cleanse the air from environmental impurities including cigarette smoke and other disagreeable odors. EMF (electromagnetic frequency) pollution is the fastest growing pollution on the planet." says health guru Andrew Weil, MD. If youâ€™re looking for EMF protection products that are unique, effective, affordable as well as attractive, weâ€™ve got them! Wearing or carrying personal EMF protection is a must for staying healthy in todayâ€™s high-tech environment. The Guardian pendant provides overall personal EMF protection from all types of frequencies and also enhances energy. 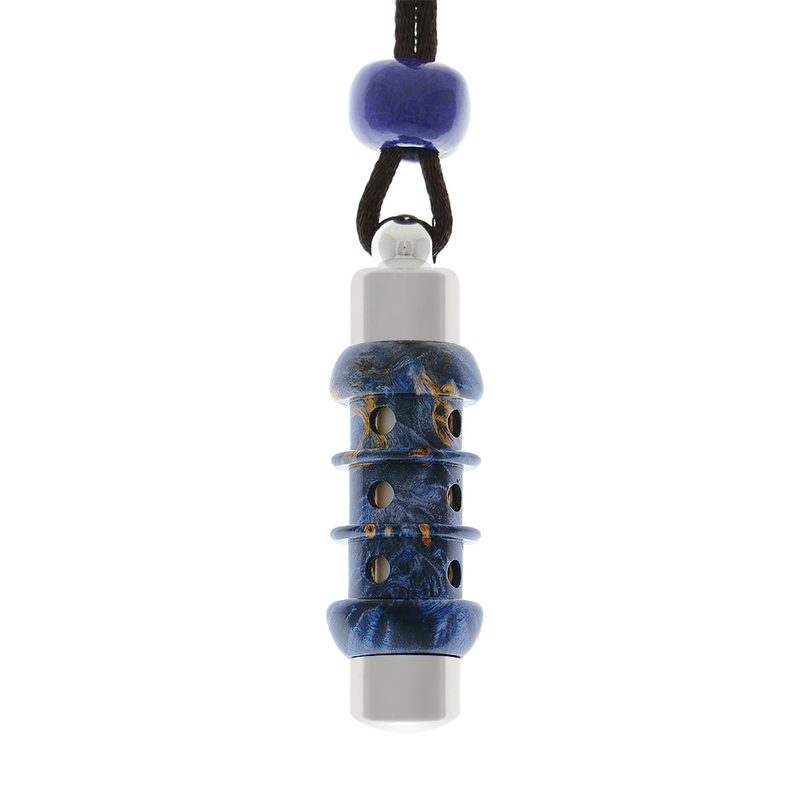 This revolutionary ceramic bead transforms harmful radiation into beneficial frequencies! The heart is electrical in nature, as is the brain. There is new evidence that points to the heart and other organs being drastically affected by electromagnetic frequencies, particularly wireless frequencies. Man-made electromagnetic fields impact all living organisms. Studies show that our dependence on 'wireless' technologies, such as Wi-Fi apparatus, cordless phones, and other modern conveniences could be creating many preventable physical and mental ailments. Safe-guard yourself and your family from harmful radiation today! Order your EMF Guardian pendant! 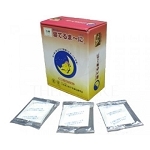 Pearlcium Pearl Powder restores alkaline pH - provides an alkaline and antioxidant environment to neutralizing acidity and inflammation in our body. 10 (ten) 15' rolls with 10 dispensers, 10 refills, at a 10% discount! 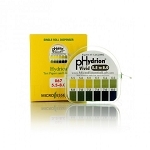 pH paper for testing in the 5.5 - 8.0 range. The Red and White Swirled Mini Whifferâ„¢ is perfect size for children, pets, or adults who prefer smaller pendants. 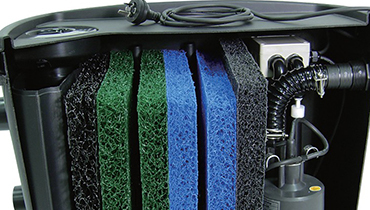 The shell is made out of durable, waterproof material that will not crack or stain. Each Whiffer comes ready to go with its absorbent cotton stick inside. 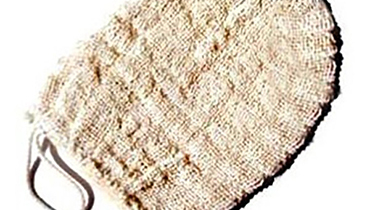 Packet of 12 cotton refill sticks $8.00 - Save on postage later by ordering extra refills now. Copyright TheraPure Health Essentials Corp. All Rights Reserved.